An unaltered photocopy of your DD-214 or WD AGO clearly displaying your Order of the Bayonet authorization. If your authorization is not displayed on your DD-214 you must provide a copy of your DD-214 -AND- a copy of your authorization document. 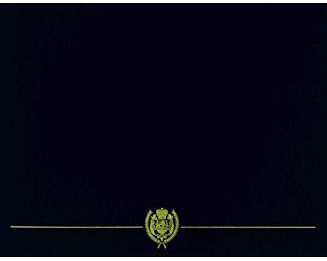 Authorized to members of the 7th Infantry Division for personal Performance of duties deemed by a commander to be Above and Beyond the call. 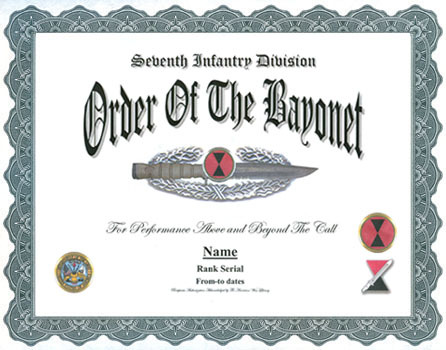 "Bayonet" was the code name stamped by General MacArthur for his secret movement of the 7th Infantry Division to Korea as a lead unit of his Inchon operation, 10-19 September 1950. MacArthur intended the 7th ID's arrival in Korea to be a "fiercly mortal and deeply penetrating bayonet stab into the very heart of the enemy" due to its composite makeup of various gung-ho unit elements newly assigned to the re-fitted 7th ID that resembled MacArthur's composite "Rainbow Division" he commanded during WW1. Upon arriving in Korea the 7th replaced its WW1/WW2 nickname, "Hourglass", with "Bayonet". The successful Inchon landings that quickly penetrated deeply into enemy held territory and fought many man-to-man battles with fleeing North Korean and Chinese soldiers prompted MacArthur to order his PR staff to refer to the 7th ID as his "Bayonet Soldiers" when reporting their successes to war correspondents.